A very big THANK YOU to WHSmith in Cardigan and to Waterstones in Aberystwyth for letting me come and sign my books in their shops again. I had a wonderful welcome, as always, and met lots of interesting and creative people. Thank you to everyone who came along for a chat and to buy books. I hope to see you all again soon! 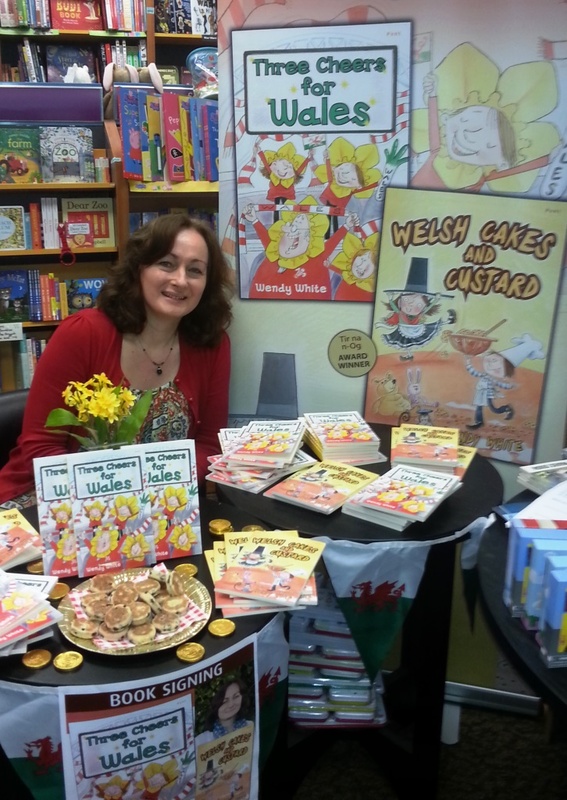 The school holidays are nearly here and I’m looking forward to some summer book-signings. Waterstones, Aberystwyth on Thursday, 13th August from 1 p.m. to 4 p.m.
WHSmith, Llanelli on Saturday, 15th August from 11 a.m. to 3 p.m.
Waterstones, Carmarthen on Wednesday, 19th August from 11 a.m. to 3 p.m.
WHSmith, Newport on Saturday, 22nd August from 11 a.m. to 3 p.m.
and WHSmith, Bridgend on Saturday, 29th August from 11 a.m. to 3 p.m.
Come along to say hello and have a Welsh cake!